You will find a list of frequently asked questions below. Click on the thumbnail image to display a larger image. If you have any questions, please contact our technical support team. 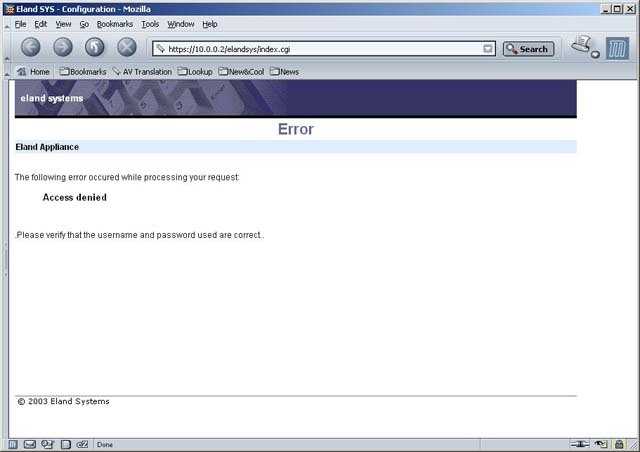 The Eland SYS/2 Appliance uses a Web User Interface (UI) which allows the user to configure it through a Web browser. You can use MS Internet Explorer 5.0, Mozilla 1.0 or any other compatible browser. Open your web browser and type in the https:// followed by the (LAN) IP address of the Eland Appliance. For example, type in https://192.168.0.1 if you have assigned 192.168.0.1 as the internal IP address. A window will pop up. Type in your login name and password and click on the OK button. A Welcome message will be displayed if the login is successful. The configuration options are grouped in a menu which is displayed in two rows near the top of the browser window. The top row is the main menu. Click on an item in the menu menu to display its sub-menu. Why do I get an Access Denied error message when I login? 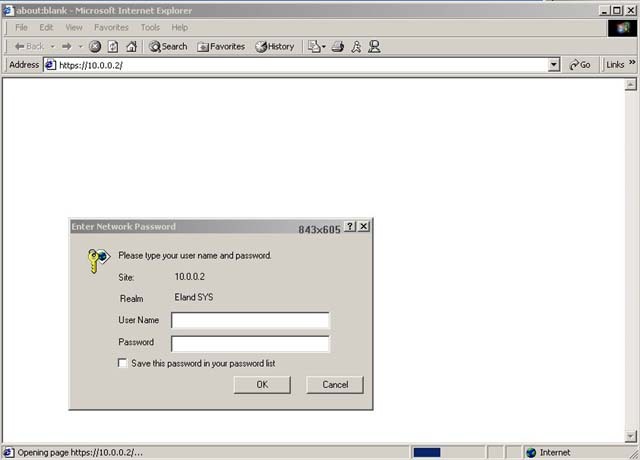 The username or password used to access the Web UI is incorrect. Click on Manage in the menu. Select the change password link for the user. How do I find out which services are running? 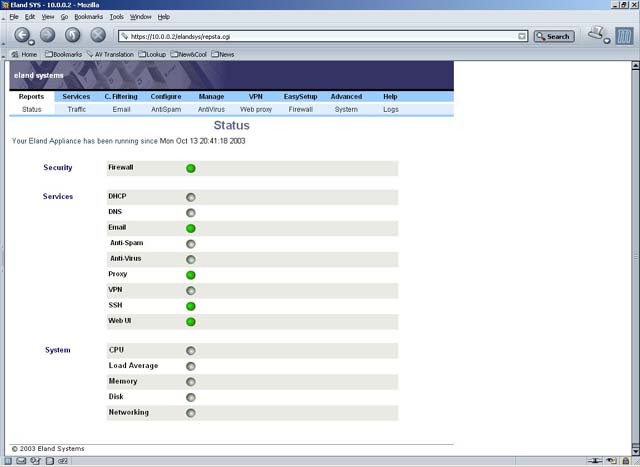 You can view the status of the services running on your Eland SYS/2 Appliance by going to Report/Services in the menu. A green ball next to a service indicates that the service is operating normally. A grey ball indicates that the service is currently disabled. If a service is not running correctly, an orange or red ball will be displayed next to the service name. You can view mail statistics by selecting Reports/Mail in the menu. 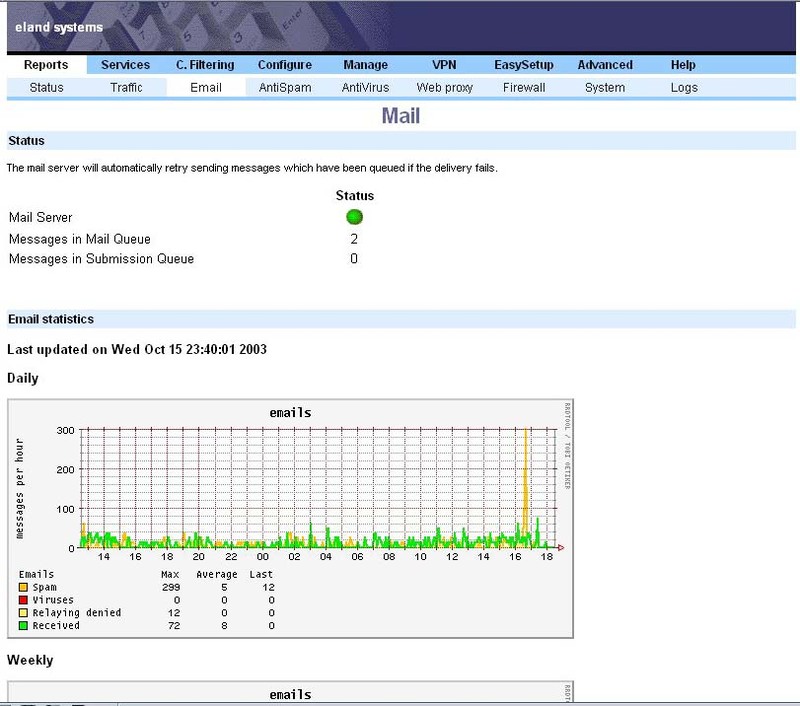 The Eland Appliance will display the amount of email messages received per hour (green line), the amount of spam (orange line) and viruses (red line) caught. Can I get a list of spam caught by the AntiSpam service? The Report/AntiSpam menu will show a list of spam caught by the AntiSpam service. The Report/AntiVirus displays a daily report of email-laden viruses that have been blocked by the AntiVirus service. 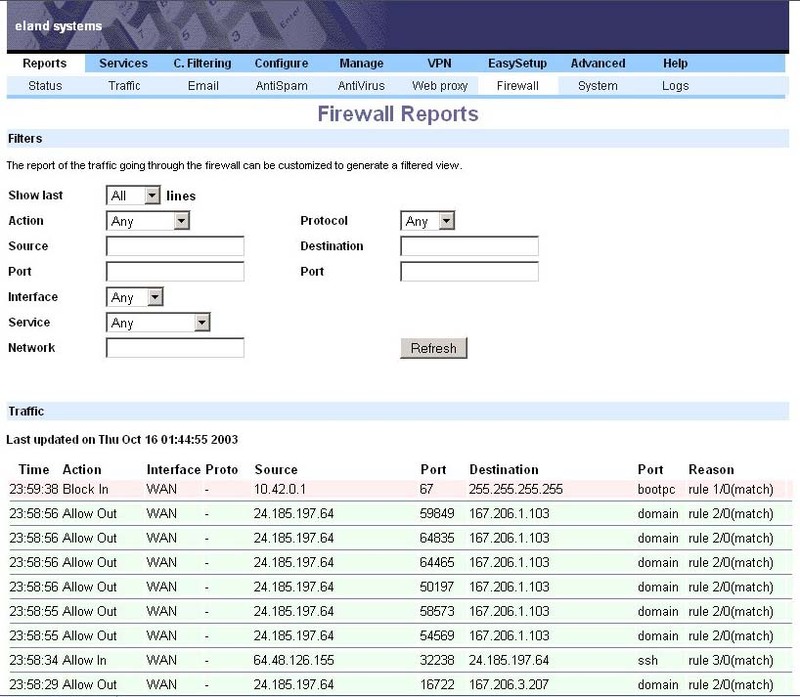 You can monitor the firewall activity by going to the Reports/Firewall menu. The rows with a pink background are packets of data that are blocked. The rows with a green background identify the packets that are allowed through by the Firewall service. The Firewall report can be customized to generate a filtered view based on the criteria selected in the top part of that window. 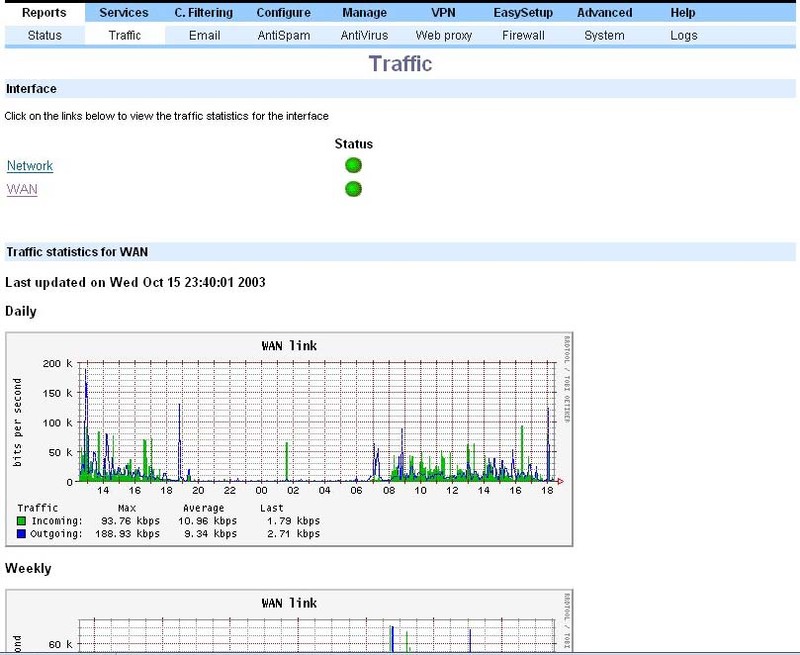 The Eland Appliance can be used to gather incoming and outgoing traffic statistics of your Internet link (WAN). The figures are shown in bits per second. File sizes are usually measured in bytes. One byte is equal to eight (8) bits. Traffic is measured in bits or kilobits per second. 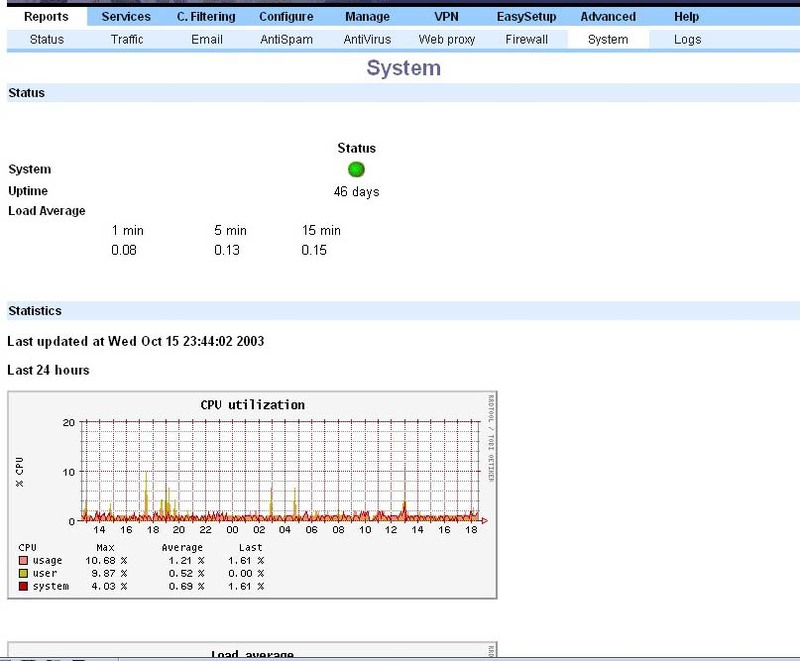 The Eland Appliance collects system statistics every five minutes and generates graphs which can be used to monitor the operating system performance. 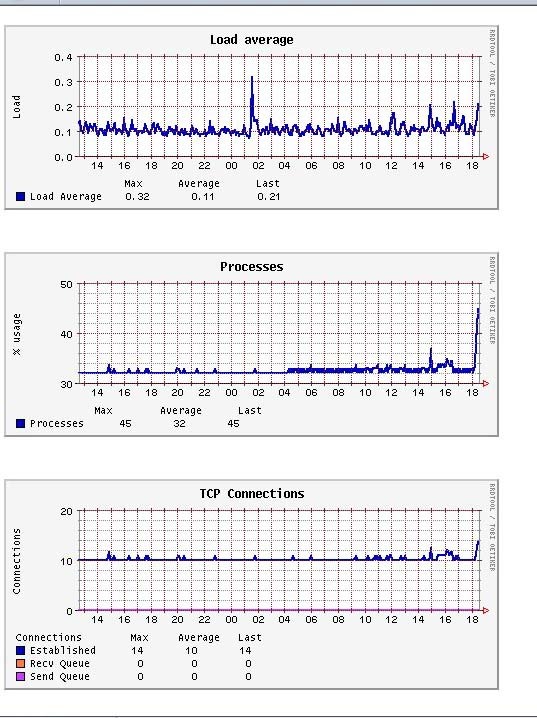 You can view the load average, CPU activity, number of TCP connections and running processes, disk usage and system uptime. How do I whitelist a sender's email address? It may happen that a valid email is tagged as spam. 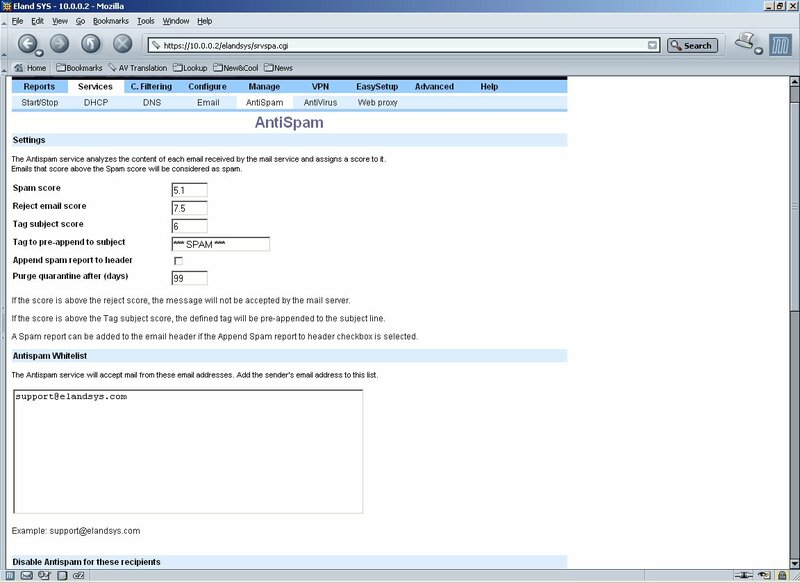 You can configure the AntiSpam service to allow the emails through by adding the sender's email address to a whitelist. Select the Services/AntiSpam menu to add an entry to the whitelist. Please add only one entry per line. Mailing lists may use a sender's address which is different from the one displayed by your email program. Click here for instructions on how to view email headers to determine the sender's address. How do I disable the AntiSpam service for a specific recipient? 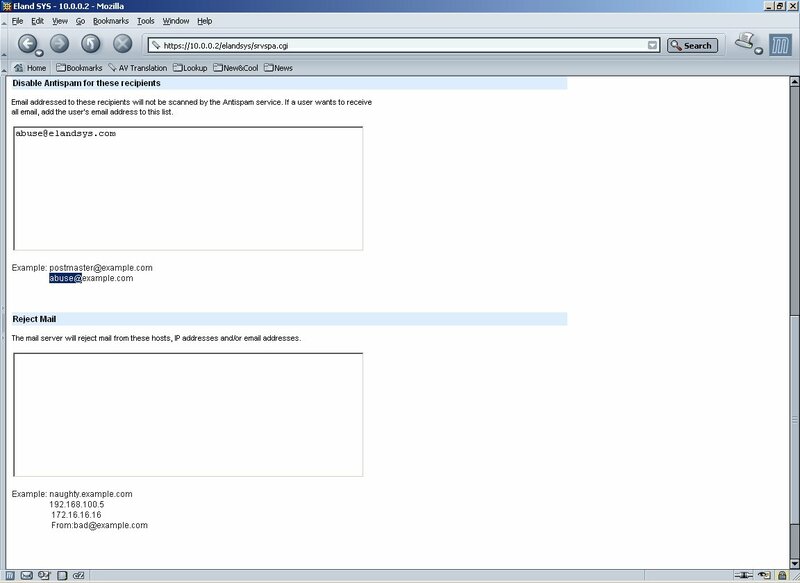 The AntiSpam service can be disabled for a specific recipient by adding the person's email address to the Disable Antispam for these recipients listbox. You can configure the mail server to reject mail sent from a remote server by entering the IP address or the domain name of the remote server. Mail can also be rejected based on the sender's address. Type in From: followed by the sender's email address. The mail server will no longer accept mail from the particular sender. When was the AntiVirus updated? The Reports/AntiVirus menu displays a web page which shows the date of the AntiVirus signature database. The Eland Appliance is configured to automatically download the latest AntiVirus update twice daily if a new version is available. When does my AntiVirus license expire? Select the Services/AntiVirus menu. The expiry date of the AntiVirus license will be displayed. How do I shutdown the Eland appliance? Click on the Shutdown button. Please wait for the shutdown process to complete (the hard disk indicator light will be off) before switching off the appliance. This process may take a few minutes. Click on the Restart button. You will be disconnected from the appliance and all current connections will be terminated when the Eland appliance is restarted.